This map shows Belize and all the countries in Central America. Click here for a map of the Southern USA, Caribbean & Central America with travel routes to Belize. Click here for a great map of Belize with many roads and parks marked. Click here for a second great map of Belize. Click here for a geographical relief map of Belize and the surrounding area. Click here for a geographical relief map of the Bay of Chetumal and the northern area of Belize including Ambergris Caye. Click here for a detailed map of many of the businesses of Ambergris Caye and the downtown area, plus maps covering north of town and south of town. Click here for a great map of the island by Sal Mazzullo, PhD, who has studied the geography of the island for decades. Click here for another one of Dr. Sal's maps, this one of the dive sites in the area. Purchasable 2X3 feet. Click here for one of Dr. Sal's maps of the localities/ geographical areas of Ambergris Caye. Purchasable 2X3 feet. Click here for one of Dr. Sal's maps of Belize, very detailed and with many Maya sites marked. Purchasable nine by eleven inches. Click here for a very detailed map of the island area and the lagoon to the west. 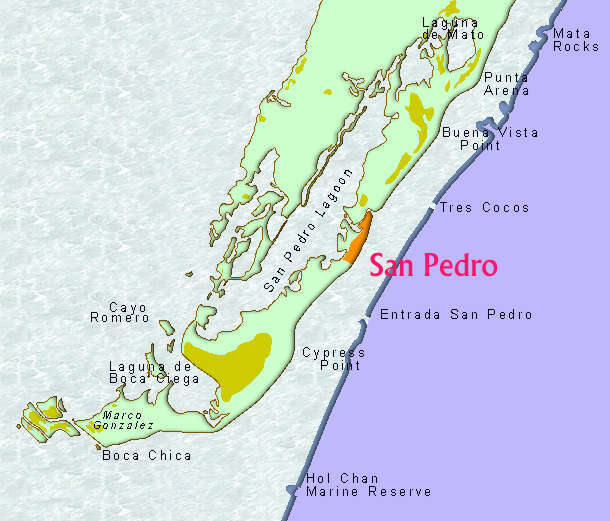 Click here for a map of the southern end of the island around San Pedro. Click here for a map of the original land grants and the 83 families who received them. Courtesy George Parham. Click here for a map of many of the streets downtown, with some businesses marked. Click here for our online store. 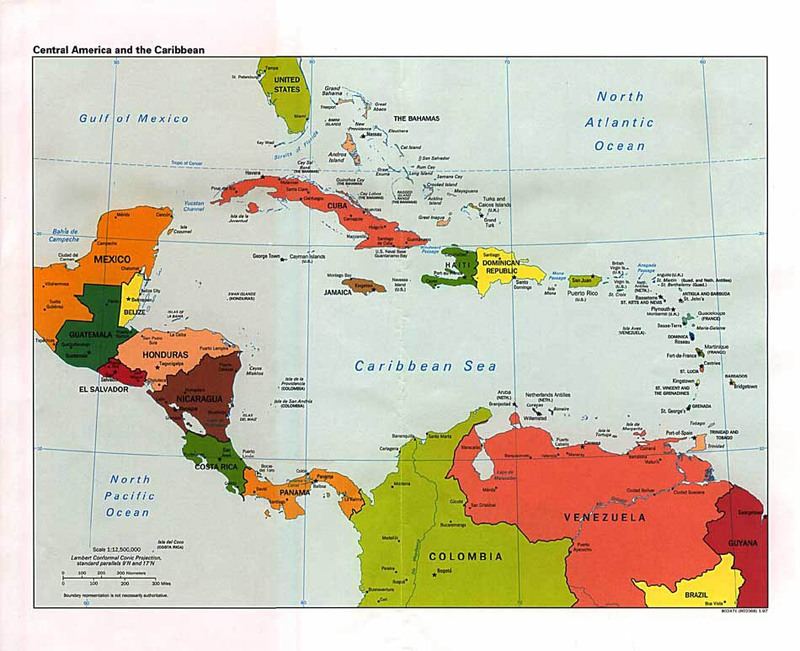 Maps for much of Central America are available. Click here for Belize Economics & Investment Guide. Also has a maps page. Click here to download an awesome map of the island. Courtesy of Triton Properties, it is a 1.2 mb file that is suitable for printing. The map is 10 inches by 16 inches and 150 dpi. It is in JPEG format, so load into Photoshop or other image manipulation software. Will not load into browser (Netscape). Too big of an image. Click here to see a map of the island with dive sites marked. Shows mangroves, reef sand flats, and reef crests as well as the land areas. Click here for a political map of Belize. This map shows the various villages, towns and cities in Belize as well as major highways, rivers, islands and elevation of the country. Click here for a physical map of Belize. This map shows the various villages, towns and cities in Belize as well as major highways, rivers, islands and elevation of the country. Click here for an antique map of Belize and Central America. This map shows a 19th century map of Belize and all the countries in Central America. Click here for a Belize and Central America map. This map shows Belize and all the countries in Central America. Click here for an 18th century map of Belize and Guatemala. The 1/2 mile from the beachline to the reefline has an abundance of wonders. Click here for detailed information about this area. A detailed list of the various mammals, invertebrates, fish, birds, and other creatures that inhabit these waters can be read by clicking here.